Today was one of those days where I felt like I was winging it all day long! I found out when I was leaving work Friday that I would be making a staff lunch today. With such short notice I had NO plan, and no chance to prep anything or get any vegetables harvested. So when I walked in the door this morning, I knew I needed to get started right away. 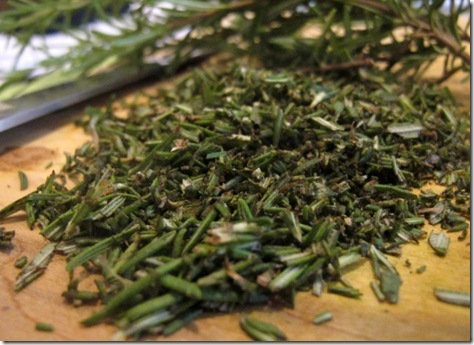 And chopped up a big handful of fresh rosemary picked out of the kitchen garden. 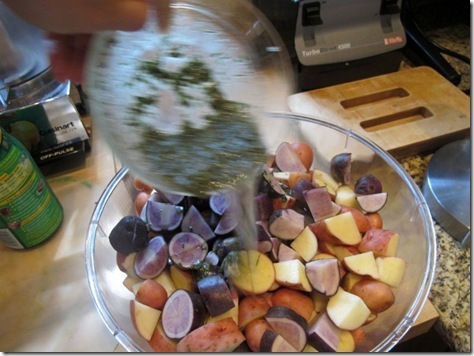 And then dumped it onto the big bowl of sliced potatoes. 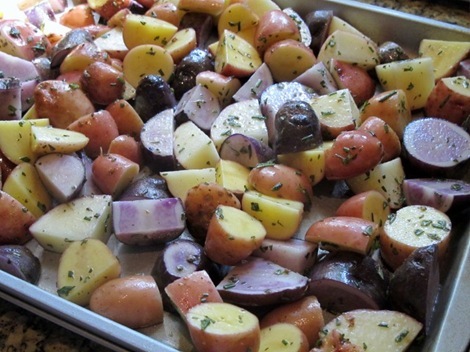 And then poured out onto a sheet pan. I started these off at 400 and let them roast for about 45 minutes, stirring every 15 or so. Once they were browned and fairly soft, I backed the heat down on the oven to 200, and left them in there for an additional hour (because I was serving them at a specific lunch time). 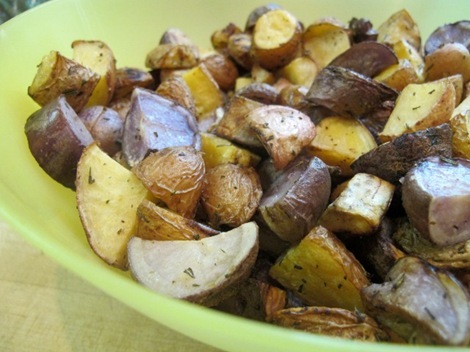 Starting them high and then backing the heat down low resulted in absolutely delicious potato pillows. The farm boys gobbled up every last one! 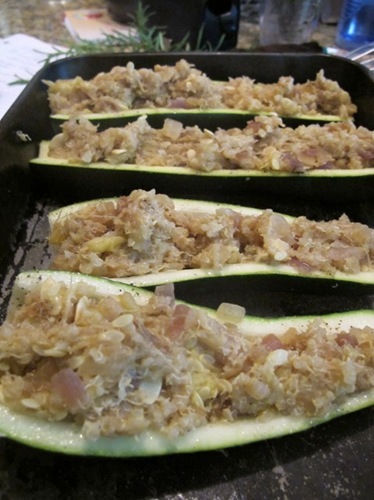 For a main course at the lunch, I decided I was going to make zucchini boats – something I had never actually done before. 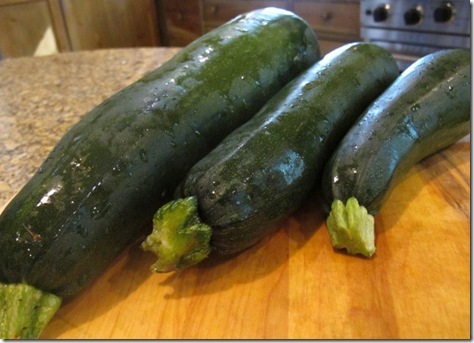 I knew it would be a little bit tricky since I had three varying sizes of zucchini, but I decided to just go with it. 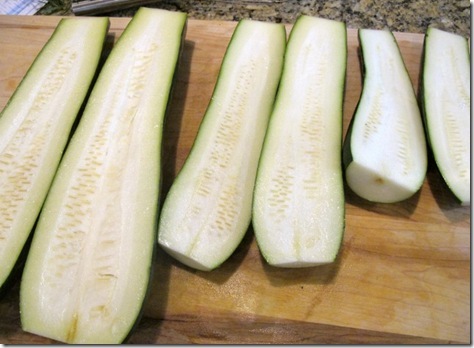 First step was to cut the ends off each zucchini and slice them all vertically into two halves. Papa, mama, and baby bear. Then I took a spoon and scraped out the fleshy stuff inside each half. If I had been at home I would have used a melon-baller or my serrated grapefruit spoon, but this regular spoon was fine too – just took a little more arm muscle! 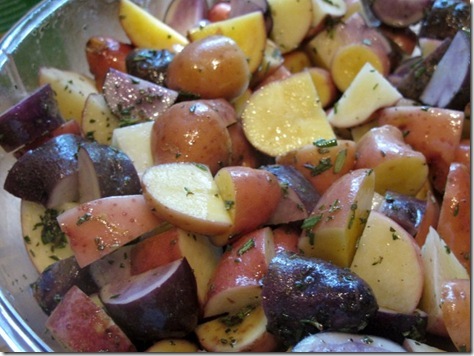 And then drizzled the inside of each half with a little bit of olive oil, salt and pepper. Time for the filling! 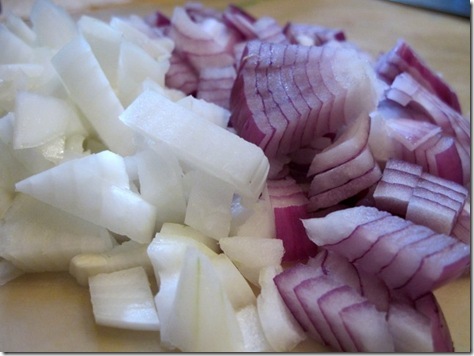 I started by chopping up one small white onion and half of a huge red onion. 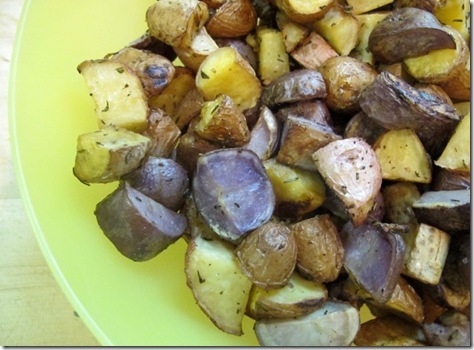 Threw them in a sauté pan with olive oil to soften and start to brown. 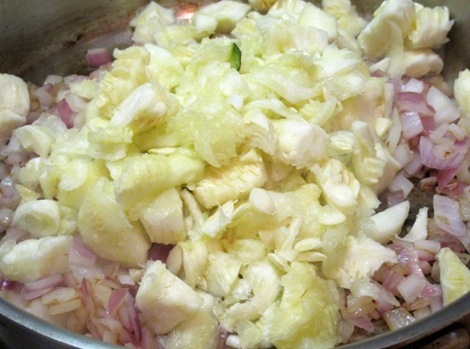 With the onions softened, I chopped up the zucchini guts and threw them in to the pan to cook too. Meanwhile, I also cooked up some quinoa in my nifty rice cooker. Because our farm lunches are vegetarian, I always try to incorporate some sort of veggie protein. Quinoa is such a quick and easy way to do this! If you don’t have one of these, you can very easily make quinoa on the stove top in 20-25 minutes. 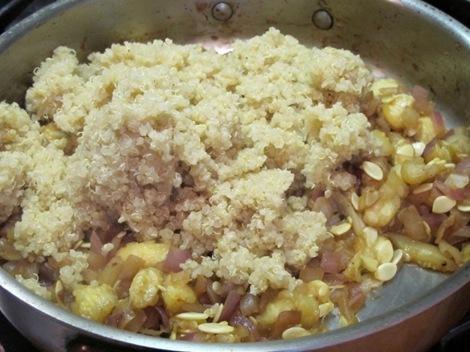 Just use a 1 cup quinoa to 2 cups liquid ratio, and simmer until all the liquid has been absorbed. Once the quinoa was cooked and fluffed, I added it to the pan with the onions and guts, and then sprinkled it with a little cumin and lemon juice. Once it was seasoned to taste with salt and pepper, I tossed in a handful of shaved parmesan for a final flavor boost. And then gave a final topping of a little extra cheese for melting. Into a 400 degree oven, covered with foil for 30 minutes, and then uncovered for an additional ten. 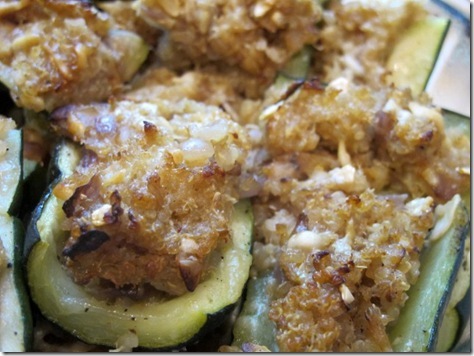 Final product – gooey and browned zucchini goodness! Since I was cooking for a large group and wanted to make sure I had enough servings, I cut the halves into equally sized pieces, and stacked them together in a serving dish. These were a HUGE hit! The farm staff seriously freaked out. They declared it the best lunch ever – hurrah! 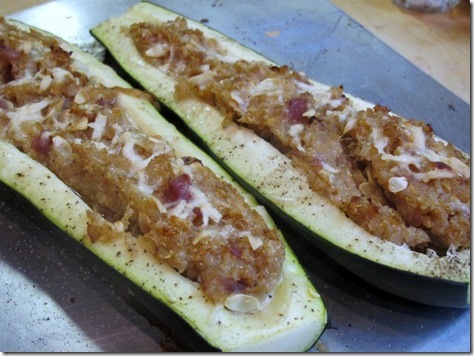 The parmesan cheese was a great addition, and by taking the foil off for the last ten minutes, there was just enough crispiness and browning. 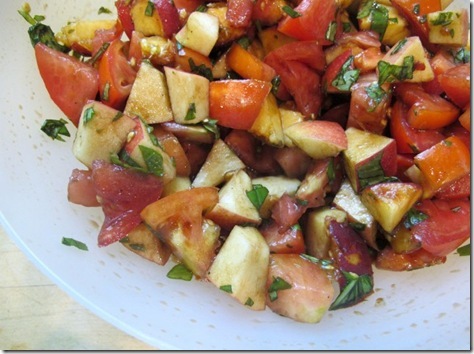 Tomatoes, peaches, red apples, and basil – all chopped up and tossed in a homemade balsamic vinaigrette. Perfect sweet ending to a delicious meal. This week kicks off the next round of summer travels and craziness, starting with Friday’s trip to DC to find a place to live! After that I’ll be heading down to the ATL for a wild bachelorette weekend, and the following weekend I’m up in Chicago for the Healthy Living Summit. (Who else is going?!) Should be a fun and busy few weeks! 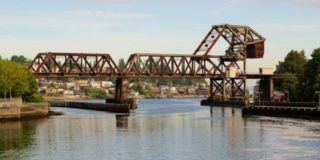 « Previous PostLessons Learned On a 100 Degree Run. Next Post » Easy As (Tomato) Pie. 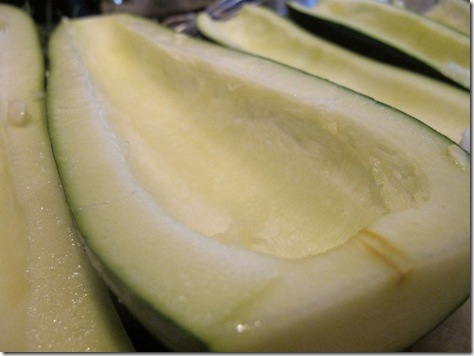 I’ve been wondering how to use the oh-so-many zucchini that have grown in my garden. 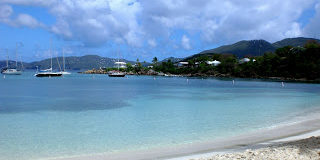 I just happened to check your blog this AM while eating my lunch and was SO excited to see your post! I’ll have to try the zucchini boats. I especially love that you used quinoa, a grain I’m always trying to use more. I’d also like to hear your recs on a rice cooker. I’ve been looking for one, but don’t know which is best. Maybe it is time for me to do a rice cooker post. Mine is the Zojirushi, but I can do a post next week when I’m back from DC showing you a few different versions and all the great uses! I’m amazed at how you just whipped this all up. 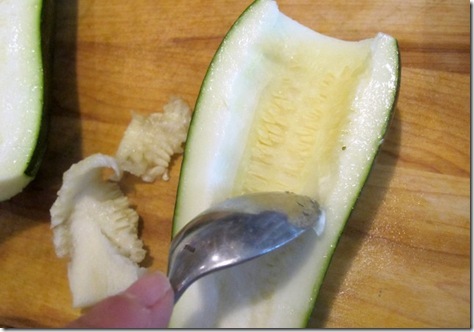 I make zucchini a lot but have never heard of doing this, and I love the idea. I might just have to try it. 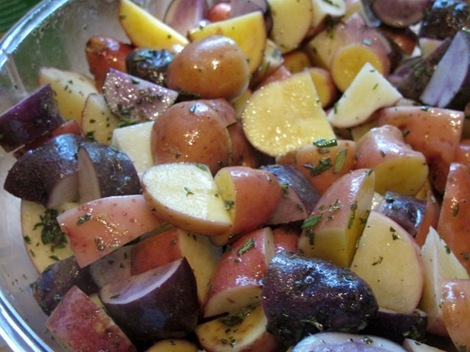 And those purple potatoes are gorgeous! I started reading your blog about a month ago, and I just love it! These zucchini boats look incredible — I’ll have to try them. When are you adding an “about me” section? I am excited to learn more about you! Hi Jenna! 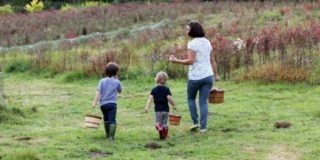 Welcome to the blog – glad you found it! The “About Me” is staring at me from my to-do list. I just need to get my pictures scanned in to make it complete. Perhaps this was the kick in the arse that I needed. :) I’ll try to get it up next week! I’ve never used vegan parmesan, but I assume it would be fine. Does it brown and melt the same way the real stuff does? Peaches + tomatoes = heaven. 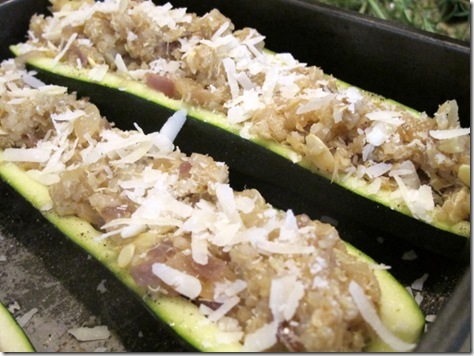 I have made similar zucchini boats, minus the quinoa, which I am now going to try and add to mine. 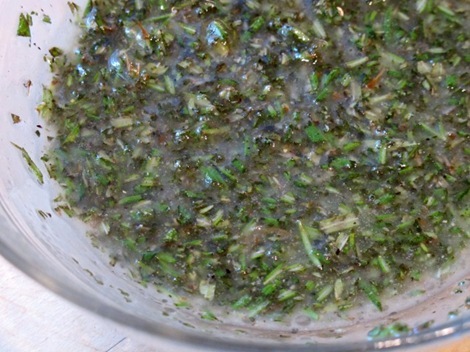 In my recipe, it calls for a bit of fresh thyme which really made the flavor great- you should try it sometime since you have access to so many fresh herbs! Tomato salad is also going on my grocery list this week- thanks! Yes, please do a rice cooker-specific post sometime soon!! Awesome meal Emily! 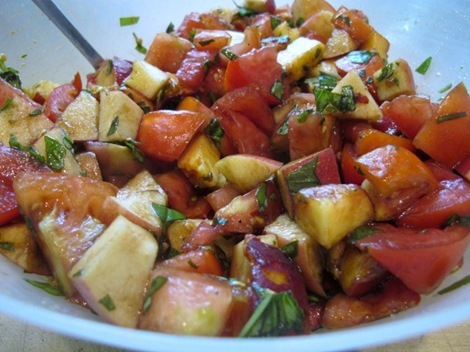 I love the zucchini boats idea and the tomatoes and peach salsa, I will be making those for sure!! yum!! 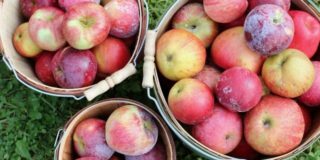 It’s hard to go wrong with fresh-from-the-farm ingredients! 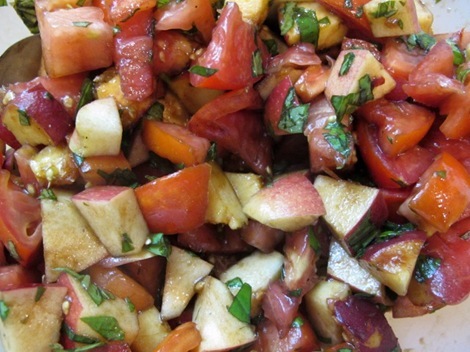 I wouldn’t have thought to combine tomatoes with apples and peaches — intriguing. 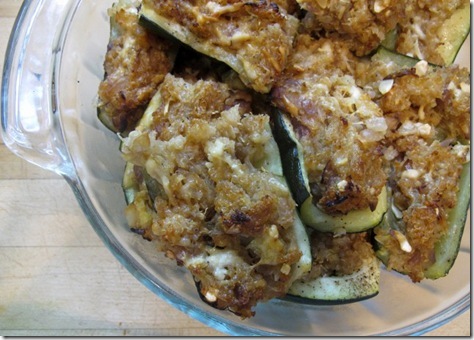 We have a bunch of yellow squash in the fridge, so maybe I’ll try stuffing those. These look insanely good. I cannot wait to make them! 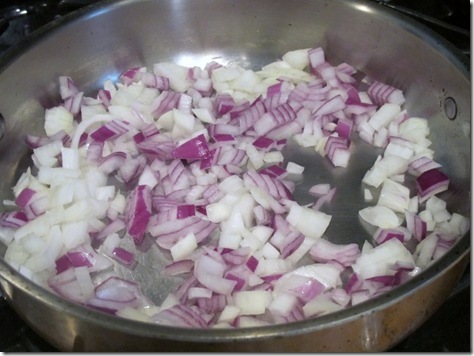 I am fearful of red onions and will have to substitute, but I have a feeling I will come up with something perfectly suitable! 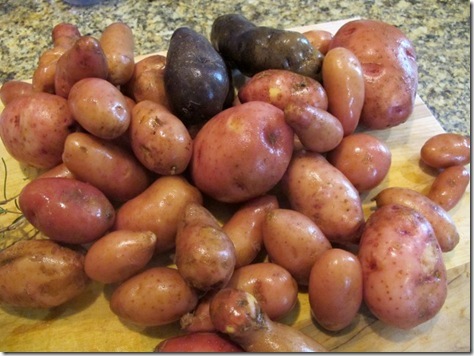 I was fearful of them too – they are SO MUCH BETTER cooked than raw. I don’t even like to touch them raw because the smell is so strong! Delicious! 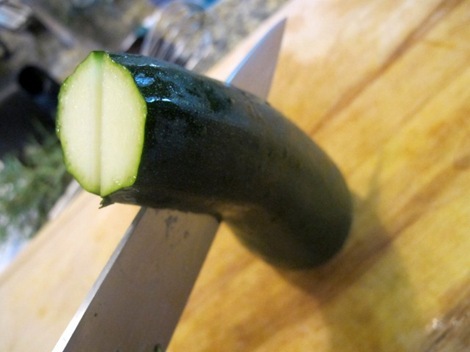 Everyone’s been doing these zucchini things lately. It looks to die for! Hi there. I have only recently read your blog a couple times and as a veg. I am always looking for good recipes! 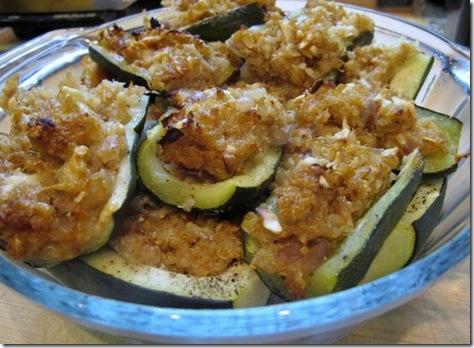 I am just curious, do you seek out vegetarian parm (as in no animal rennet) and if so where? Or, are you personally ok with eating rennet? I am not totally vegan, in fact I still eat a good amount of cheese. It’s the one dairy item I just haven’t quite kicked yet. 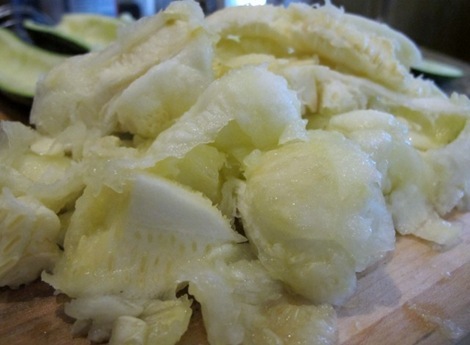 A lot of cheese is vegetarian, however many hard Italian cheeses are made with animal rennet (an enzyme from the stomach lining from a calf, which is killed for the enzyme). Many vegetarians seek out vegetarian cheese (not vegan) and Whole Foods labels which cheeses of their 365 brand are not made with animal rennet. I guess it depends on your definition but something to be aware of, animals are killed to make certain cheese. Ahh okay yes, I see your point. Everything bought here on the farm is from specialty stores like WF or Earth Fare, so I assume it’s vegetarian. The label is already thrown away :( Thanks for your info! Yum! Totally planning to make the zucchini boats. Right up my alley. And any instructions on cooking the quinoa in the rice cooker? Such a great idea! 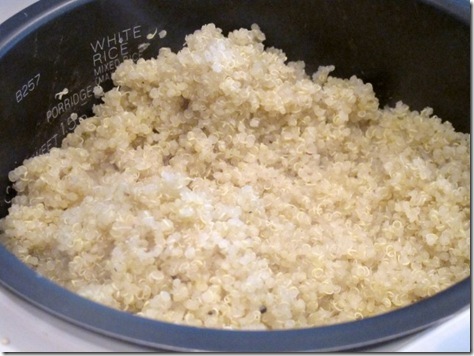 You can do quinoa in the rice cooker just like any grain – 1 to 2 dry to liquid ratio, and I usually do quinoa on the quick cooking setting. 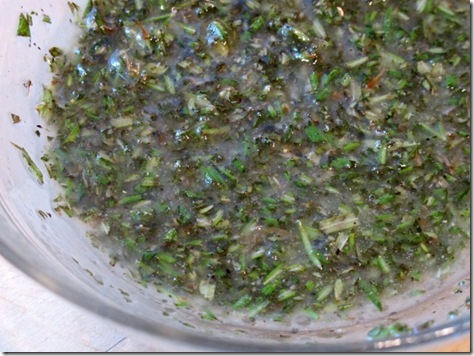 Open the lid at the end and let it sit a few minutes before you fluff. 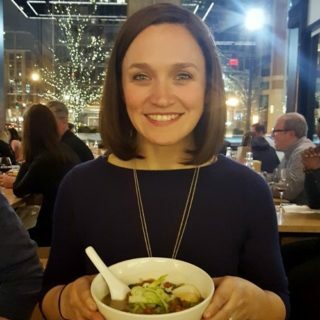 Hey Emily, just found this new blog and it looks like the author and her husband attended the dinner you put together at the farm! (the first one with the raw, vegan chef). Funny when blog worlds collide. All of the farm lunches you make look absolutely delicious and so creative. Thank you for sharing them with all of us! I’m definitely going to have to try my hand at a few sometime soon. This quinoa zucchini boat recipe is amazing! I made it for dinner twice in the last two weeks. And of course it made leftovers, so we had it for more than two meals. The second time I added minced garlic with the onions. 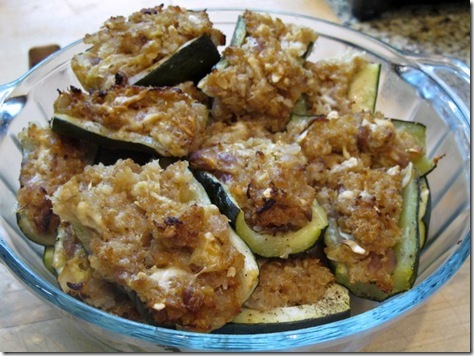 Thanks again for a great recipe!